Entertainment Brand Partnerships is a term that embodies a wide range of opportunities where brands and their products come together with the power of movie and television content to create strategic marketing partnerships. Warner Bros. Entertainment is a global leader in movie and television content. The partnership ideas we develop and create allow brands to become part of some of the most exciting, engaging and emotional forms of content known. For us, it’s about finding ways to connect multiple elements of your brand identity and your consumers with the themes and audience appeal of the IP that Warner Bros. creates. These partnerships have the capacity to help cut through traditional marketing communications. When the fit is mutually beneficial to both parties and the idea is right, we have helped create amazing moments that can connect across a diverse range of platforms and media. Moments that can drive brand preference, customer loyalty and sales. We see these partnerships as an exchange of value. We don’t charge a licence fee. We simply look for reciprocal partnership opportunities that reflect a mutual interest and direction around some of the world’s leading content and its associated talent. What are Entertainment Brand Partnerships? Partnerships are implemented by incorporating the entertainment product’s assets or IP into the partner brand’s own marketing activities. Typically involves working hand-in-hand with a partner and their retail estate to create an experience or an offer based around a branded product or a limited edition range. Sometimes the theme or style of a particular movie or TV show can be re-created to develop an exclusive look or event that allows the store to display its own products in new and innovative ways. This type of partnership is often used to drive sales around a specific campaign for a brand partner – through harnessing the appeal of entertainment content either on or around the partner’s product. 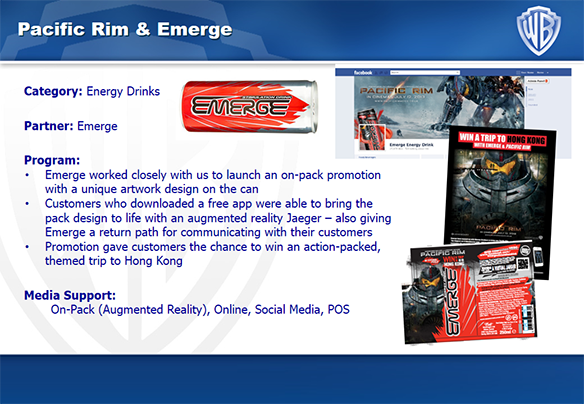 More recently we have begun to see an increase in the demand for digital engagement around physical product. This is now becoming increasingly common amongst brand partners seeking to understand more about their customer. As such, Warner Bros. have helped create new and innovative ways for brand partnerships to help unlock customer data or a return path to the buyer – for exmaple, through the creation of a digital application or a simple social media entry mechanic (for a competition). Limited edition merchandise and competition prizes that include exclusive movie-related experiences also tend to work exceptionally well at driving consumer engagement in a partnership - through offering what are traditionally perceieved as high value or money-can’t-buy prizes. 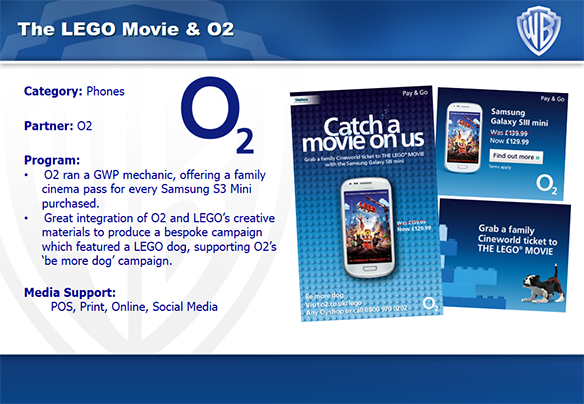 For example, our recent Lego Movie partnership work with Samsung delivered double-digit growth in Galaxy SII handset sales, in what was an exceptionally competitive period for the smartphone market. 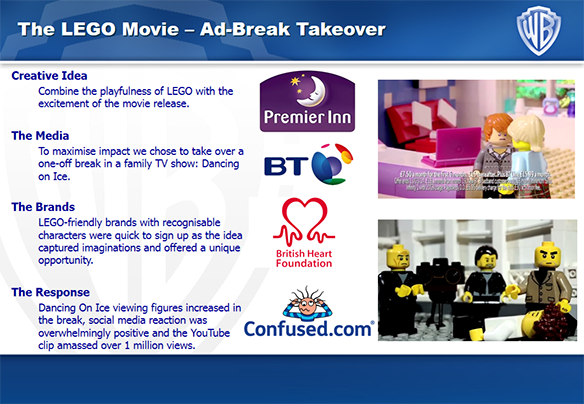 Traditionally, these types of partnerships focus on creating a platform from which to integrate and amplify the core editorial themes of an entertainment property – usually alongside an offer from the media partner to its customers such as the opportunity to see a movie before it arrives in cinemas, for example. The range of media partnership activities are not just restricted to offers. Sometimes the creative idea and execution is simple yet effective enough to create an event on its own merit. Working with media owners to develop these types of partnership activities has tended to be something that studios and dsitributors will look to organise as part of our own marketing efforts. However more recently, Warner Bros. have put more emphasis on developing these types of initiatives jointly with brand partners and some of our most impactful marketing efforts have stemmed from creating the perfect fit between the brand, content and media partner. The most impactful and innovative entertainment brand partnerships have traditionally come from activities that integrate the brand fully across all these partnership platforms and more. This will involve working more closely with filmakers and talent to co-develop an offering that allows a brand to really immerse itself in an entertainment property. 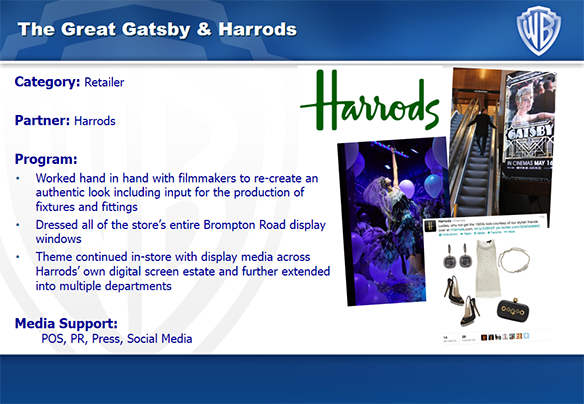 Examples of this range from creating exclusive or bespoke content for brands to use through to developing approved branded products to sponsoring a movie Premiere. These are the types of partnerships Warner Bros. love to collaborate on. 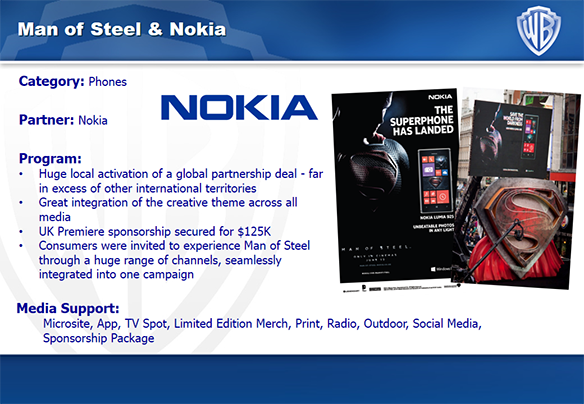 Whilst it does require a brand to support the initiative across multiple departments and functions, these partnerships typically elicit our very best work – creating the opportunity for brands to position themselves directly alongside some of the most powerful and iconic entertainment properties in the world, often riding off the coat tails of multi-million pound marketing investments from the studio itself.